Do you have a diseased or damaged tree growing on your residential land or public area? Then it’s time to look for assistance from our East Rand tree fellers. Carrying out your own trees removal can be a risky endeavour, considering your lack of expertise in this area as well as lacking the advanced equipment needed- that is where we come in. 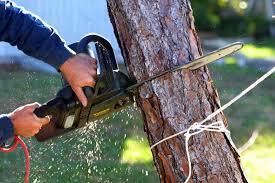 We’ve extensive experience in removing trees from various areas in Johannesburg. We provide the most affordable tree felling services in East Rand and other areas for residential properties as well as commercial ones. To ensure the safety of the tree felling task, we utilize state-of-the-art equipment to cut the trees down without causing damage to other trees or surrounding buildings. Besides our East Rand tree felling services, we can assist you with hedge trimming to make sure that your lovely tree is well trimmed. We provide a broad range of services to satisfy the needs of our clients. We can as well provide stump grinding services, as well as offer lawn supplies to cater for your needs. When it comes to offering the best tree felling services, no other company in the area can match up to our reputation. We offer fast, efficient and safe services, and utilize advanced tools and equipment. Contact us on 087 551 0614 now for more information on our services or to request for a free price estimate. We’ll be happy to offer our assistance regardless of the size/magnitude of the task at hand.